The air-conditioned rooms in this hotel each have a private balcony or a terrace. The hotel is set in beautiful gardens that overlook the Indian Ocean and its private beach can allow you to go for a swim at your own convenience. It also has two outdoor swimming pools where you can cool off after a relaxing massage or beauty treatment at the spa. Aside from offering airport shuttles to Malindi Airport, the hotel also has free parking and 24-hour reception service. Each room at this hotel is air-conditioned and comes with a flat-screen TV with satellite channels. The hotel offers a private beach area, a hot tub, and a fitness center. This hotel is best for outgoing persons as it offers a good number of outdoor activities such as golfing and snorkeling. Bike and car hire are also available. If you are a person who is constantly catching up on what’s happening on the internet, Leopard Point Luxury Beach Resort and Spa has got you covered with its free Wi-Fi that is featured throughout the property. This hotel features 2 restaurants, 3 bars, and a spa. Tropical Restaurant serves buffet-style international and Italian cuisine and Savanna Restaurant serves a selection of seafood dishes. Each room in this hotel is air-conditioned, has a private balcony and a terrace, and is equipped with a minibar. While at Sandies Tropical Village, you can always enjoy a beauty treatment at the spa and cool off by the swimming pool afterward. This hotel is graced with beautiful Swahili architectural designs. All rooms at Kilili Baharini Resort and Spa are air-conditioned and come with a private veranda. The hotel has a private beach, 5 swimming pools, a beachside restaurant, and a wellness/fitness center. Guests can enjoy a hot tub, a steam bath and relaxing massages at the spa which are present in the hotel. Babysitting and car hire services to take you to different places are also available. The resort offers a free shuttle to Malindi Airport and a shuttle to Mombasa Airport can also be arranged at a surcharge. 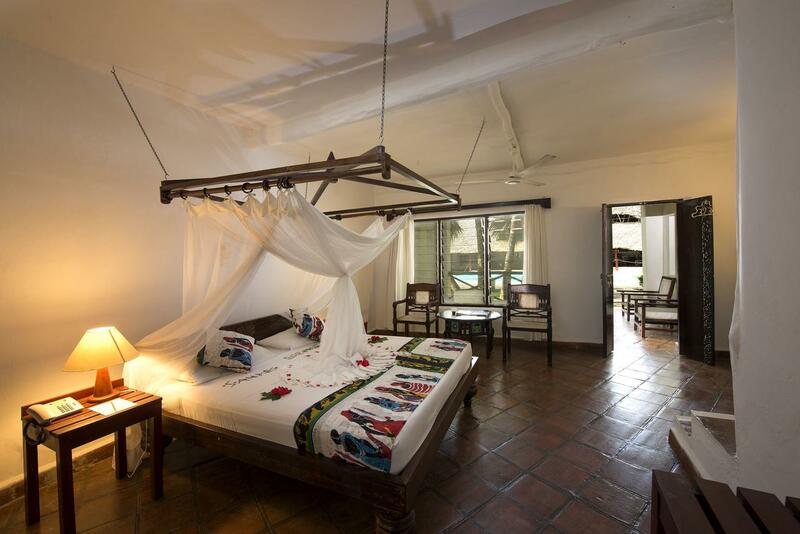 African House Resort is only a 5-minute drive from Malindi’s CBD. All rooms are air-conditioned, have a four-poster bed and open-air terraces with wooden ceilings. They also come with a private veranda, a satellite TV, a mini-bar and a large bathroom. For breakfast, lunch, and dinner, you can enjoy Swahili and Italian cuisine that is offered at the à la carte restaurant. Free tea, coffee, and pastries are also served every afternoon. You can spend an afternoon receiving relaxing massages, cooling off by the pool or enjoying African art at the art gallery present in the hotel. Every room in this hotel is complete with a private bathroom equipped with a shower and a hair drier. Some rooms even contain a private balcony. The hotel has an in-house restaurant that serves a continental breakfast each morning and a variety of international dishes. The outdoor pool at the hotel is a good place to spend your afternoon. The staff at Malindi Dream Garden speak English, Swahili, and Italian and are always at your service. Located along the silver sand beach of Malindi, Diamonds Dream of Africa features a beauty center and a spa offering breathtaking views of the ocean. Each suite in the hotel is air-conditioned and is equipped with a flat-screen satellite TV, a mini-bar and tea/coffee-making facilities. Each room also has a private terrace with lounge chairs that can allow you to relax and marvel at the beauty of the hotel at the comfort of your room. Fresh fruits, snacks and informal lunches served at the pool bar won’t allow you to stay hungry on the days that you may spend at the pool. The main restaurant has an open-air terrace overlooking the swimming pool and the in-house restaurant serves a selection of seafood dishes. Guests can also shop at the fashion boutique on the property.